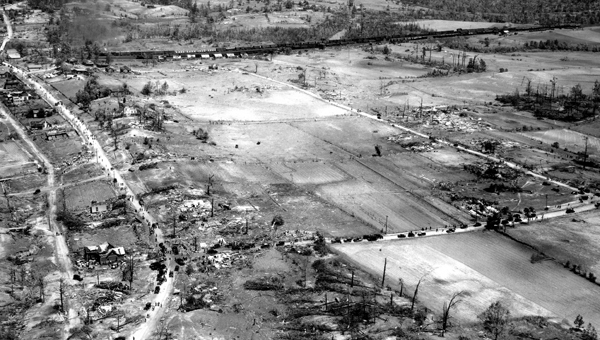 Two devastating tornadoes were responsible for 25 deaths and 227 injuries in Central Alabama in the predawn hours of May 5, 1933. The first was an F3 tornado which touched down at 12:20 a.m. and moved through Choctaw, Sumter, and Marengo counties, killing four and injuring 27 people along its 35 mile long path. Three of the fatalities occurred at Demopolis in Marengo County where 50 homes were destroyed. The second tornado touched down around 2:30 a.m. and moved through Bibb and Shelby counties along a 35 mile long path. This tornado had damage consistent with an F4 rating and was responsible for 21 deaths and 200 injuries. Hardest hit was the Shelby County town of Helena. There 14 were killed and 150 were injured. Five were killed in Brent in Bibb County and one was killed in the Colemont community. The photos above were taken by a pilot with the U.S. Army Air Corps and can be seen in the Helena Museum. Most of the town of Helena was directly impacted by the tornado and the Helena Depot was one of the few buildings that survived. "Roaring out of the southwest at a little past three o'clock in the morning this deadly tornado killed 20 people and caused a vast amount of property damage and human misery. The tornado's having come at night made the visitation more terrifying. Most of the people were asleep in their beds or had been awakened just as their homes were being swept away. 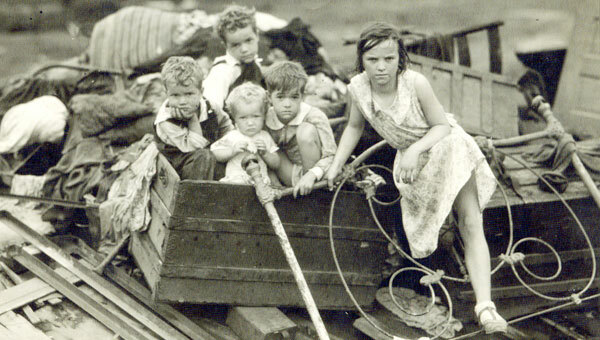 Many found themselves buried under the ruins of their homes and had to wait for relief to come. Torrents of rain poured down following the storm. Ambulances from Birmingham responded as promptly as possible, but fallen trees and debris hampered the work of relief." If you have photos, memories, or other information to share about this disaster, please email those to me at mikewx2@yahoo.com. I can also be contacted via Twitter @Bamawx or on my Facebook Bamawx page.